To most casual observers, the oft maligned beast known as progressive metal can usually be summed up in two words ... DREAM THEATER. Granted, ever since the epoch defining ‘Images And Words’ first appeared in the early 90’s, New York’s finest have had an omnipotent presence which has never been significantly challenged (at least commercially), but to dismiss a whole subculture of very talented musicians in such an offhand manner is at best misguided, and at worst … well, you work it out. Since the scene started to blossom and diversify in the wake of ‘Images And Words’, progressive metal continues to throw up a steady stream of very well crafted releases from excellent bands. Sure those Dream Theater fingerprints can be found on the vast majority, but only in the same way that AOR bands get compared to Journey, or classic hard rock acts find themselves measured against the Led Zeppelin’s of this world. No, do a little digging and you’ll unearth little gems such as Symphony X, Shadow Gallery, Threshold, Evergrey, Dreamscape and Pagan’s Mind (to name just a few at random), all of whom have built respectable back catalogues of material purely on their own merits. For my money though, if one act stands out from the crowd, it’s Vanden Plas. Based in the south western German city of Kaiserslautern, the quintet can trace their roots back more than 20 years, although it was with the release of full length debut ‘Colour Temple’ in the mid 90’s that they really began to build an international reputation. Back then their sound leaned more towards traditional classic hard rock values (albeit with bold arrangements and complex interludes), the Vanden Plas we know today really emerging fully formed at the tail end of ’97 with the breathtaking ‘The God Thing’. Here was a band who could take the Dream Theater blueprint and twist it into their own image with amazing results, and since then, they’ve never looked back. All the band work pretty much full time in musical theatre these days, so Vanden Plas releases don’t come along all that often; but when they do, they’re invariably a cause for celebration. Excluding millennium year’s ‘Spirit Of Live’ set, since ‘The God Thing’ Vanden Plas have released three more studio albums – ‘Far Of Grace’, ‘Beyond Daylight’ and ‘Christ O’ – and whilst perhaps not quite having the same jaw dropping initial impact, all three in their own way are masterpieces. Now that legacy is set to be enriched further with the latest installment in the Vanden Plas saga, ‘The Seraphic Clockwork’. Given that its immediate predecessor ‘Christ O’ was arguably their best shot since ‘The God Thing’, any follow up had a lot to live up to, but as if by magic the band once again find another gear. Another hugely ambitious conceptual affair which blends historical storytelling with their own patented brand of sizzling theatrical melodrama; the complex web of intrigue woven around some of the most brilliant progressive themes you’ll find anywhere this (or indeed any other) year is classic Vanden Plas at their bombastic best. Complex yet immediate and accessible, foreboding yet strangely compelling, its constantly shifting musical dynamic will have you clinging to the edge of your seat throughout. Those inimitable Andy Kuntz vocals, the breathtaking interplay between guitarist Stephan Lill and keyboard maestro Günter Werno, the ever changing rhythmic patterns laid down by Torsten Reichert and Andreas Lill – all established Vanden Plas trademarks we’ve come to know and love. The overarching mood may be a tad darker and more intense this time out, but as the likes of ‘Frequency’, ‘Scar Of An Angel’, ‘The Final Murder’, ‘Rush Of Silence’ and the gargantuan ‘On My Way To Jerusalem’ overwhelm your senses, you’ll see why I’m so damn excited about this album ... in a word, brilliant! 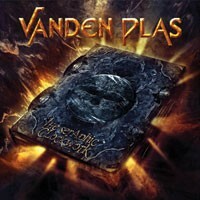 Vanden Plas is without hesitation one of the greatest progressive metal bands of our time. If not all time. Never have they disappointed, with each of their CDs, while never selling high numbers here in the U.S., consistently favor us with their mesmerizing, sensational blend of heavy keyboards, metal guitars and the pitch perfect vocals of Andy Kuntz. It is easy to put Vanden Plas in the same category of jaw dropping power/progressive metal bands like Riverside, Anubis Gate, Mindflow, Redemption, Lanfear, Royal Hunt, Pyramaze, Sonata Arctica, Demons & Wizards, Aeon Zen, or Seventh Wonder, but even as great as those bands are, it almost seems to be a disservice to Vanden Plas who since their debut, 1994's Colour Temple, they need to be just left alone. It was 1997's The God Thing which really spun my head around and I began to take note of this German lineup, and I thought no way could they ever top that. Then 1999's Far Off Grace, 2002's Beyond Daylight, and 2006's Christ O, were all released and it came clear that every Vanden Plas release would be their best yet. Which brings us to The Seraphic Clockwork. Highly technical, multi-layered, vocal heavy, this concept album released under the Frontiers Records label tells the story of a man who while in ancient Rome goes back in time to the 33rd century, who when he realizes he is under the influence of an Old Testament prophecy, he must come face to face with his own God given destiny. Quite the story to have to tell, but Vanden Plas, as always does it in high fashion. From the opening "Frequency," to the orchestral "Sound of Blood," to "Rush of Silence," which features some of the best keyboard and guitar work found on the entire CD, to the thought provoking "The Final Murder," where the piano gives way to the chugs of guitar power chords, and one can almost feel of the heart grabbing sounds of "On My Way To Jerusalem." Take a listen to this track with closed eyes, and allow yourself to be taken on a musical journey where you hear the story of a man who fears "there's no way out." Over 12 minutes long, it is a wish that this song would last another 12 minutes. Soaring to the heavens vocals, killer guitar work, preicise and difficult drumming, and multiple piano arpeggios, and rapidly played keyboard riffs that utilizes various scales, tempos and volume changes. Recently announced is that Vanden Plas' follow up to this extraordinary CD will be released in January, 2014. And yeah, I'm going to go out on a limb and all ready and say that CD will be their best yet.